The Most Popular Operating System Around. When I ask someone if they have heard of Linux, they will often say something like "Yea I've heard of it, but I don't think it will ever be very popular". Then I ask them "have you heard of Android?" Everyone has their own opinion of which Linux Distro is the best. The nice thing is that we have the freedom to choose which Linux Operating System we want. Most Linux Distros are free. Different Linux distros compete to try to be the best in the way that they see fit, but since it's open source, different Linux distros are able to make use of improvements that other distros come up with, so everyone benefits, and competition is good for creating a drive to make things better. A big part of a GNU Linux Operating system is all of the programs that make up the system. The Linux Kernel is small in size compared to all of the other programs which are usually licensed under the GNU licensing. If you have not tried Linux, you might want to give it a try. If you have been using Linux for some time now, and have learned a lot, you might want to increase your knowledge of Linux by building your own Lixux Operating System from scratch. You can download a book that will teach you how to build your own Linux From Scratch. What I have available for download is a CloneZilla image file of the 64 bit operating system. The stick version is the same thing, but without most of the source code. So it's a quicker download, and will fit on a large memory stick. Because of the file size it's better to use a dedicated downloader rather than the web browser, but you can download it with your web browser if you want. By using download software, you can start the download, and finish later, though web browsers are also getting better at that. Needs a hard drive of at least 300 GB to fit the partitions. Actual space of ext3 is 233.00 GiB with 107.74 GiB used. Needs a memory stick or hard drive of at least 64 GB to fit the partitions. Actual space of ext3 is 50.00 GiB with 33.54 GiB used. With "wget -c", if you get disconnected or need to continue downloading later, all you have to do is press the up arrow and enter, on your keyboard, and it will continue downloading. After you download the file, the file will need to be uncompressed for Filezilla to use it. It was compressed to improve downloading. When you boot the lfs-clone, you will need to tell the bios to boot as legacy bios, unless you have an older computer. The root password is "lfsisforme". The password for the 2 test users is "testuser". When you boot it up and get to the desktop login screen, click on the user "me" and log in with the password "testuser". After logging in, go to "Dektop_for_me", click on "LFS Documments", click on "ReadMe.txt". This is set up best for Mate desktop. 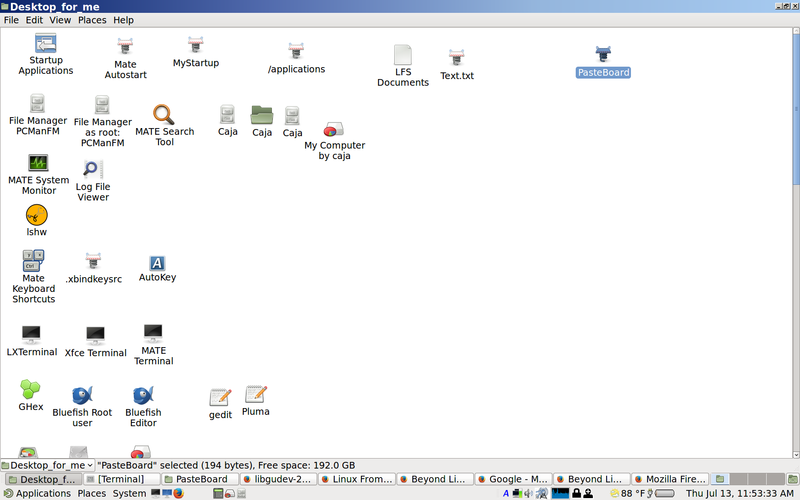 Other desktops also installed are KDE, xfce, LXDE, Openbox, and Some parts of Gnome. Here are Clonezilla instructions for putting the lfs-clone on your computer. Download Clonezilla Live CD ISO from here. Burn the Clonezilla iso to CD. Place Clonezilla CD in computer. Start computer, and boot to Clonezilla CD. When it starts up, click [enter] to start Clonezilla with default settings. Press [enter] for English, or choose your language. Press [enter] for "Don't touch keymap". Press [enter] for USB detection. Look to see that your drives are showing up. Look to make sure that your drives are showing up still. If they are not showing up, there is a problem. Select the drive that has the image that you downloaded, for "/home/partimag", and press [enter]. Note: the image you downloaded has to be extracted before you can use clonezilla. If the image "lfs-" "-img" is in a directory, select the directory that it is in, and press [enter]. Do not select the "lfs-" "-img" directory itself. After selecting the directory that the image is located in, or if it is not in any directory, proceed to the next step. Select "[ABORT] Exit_directory_browsing", and press [enter]. Select "[NO]" to not do it again, and press [enter]. Select "Expert" and press [enter] to continue. Select "restoredisk" and press [enter] to continue. Select the image "lfs-" "-img" folder and press [enter] to continue. Select the target. This step is very important. Make sure you select the correct drive, as everything on this drive will be lost. Select the drive that you want to write the disk image to, and press [enter] to continue. Select "-v" for verbose, and be sure to select "-icds" to skip checking disk size. The "-icds" option is important because I often create the image files from drives larger than what you will be using, and you can get an error if you don't select it. After selecting "-v" and "-icds", press [enter] to continue. Press [enter] to use the partition table from the image. Select "-scr" , and press [enter] to skip checking the image. If you don't select this option, it will take twice as long to complete. Press [enter] to select "-p choose". You might get a warning about target disk, and /etc/fstab. Ignore it, and press [enter] to continue. You will now get a warning that you are about to overwrite your drive. Just double check that you have the correct drive, and press [y] [enter] to continue. You will get a second warning that you are about to overwrite your drive. Press [y] [enter] to continue. Now sit back and wait, as it clones the the image. After it is done, follow the instructions for shutting down.